The binary mixture of acetone (boiling point ) and methanol (boiling point ) is difficult to separate by distillation because of the presence of a minimum boiling azeotrope ( mole % acetone at ). 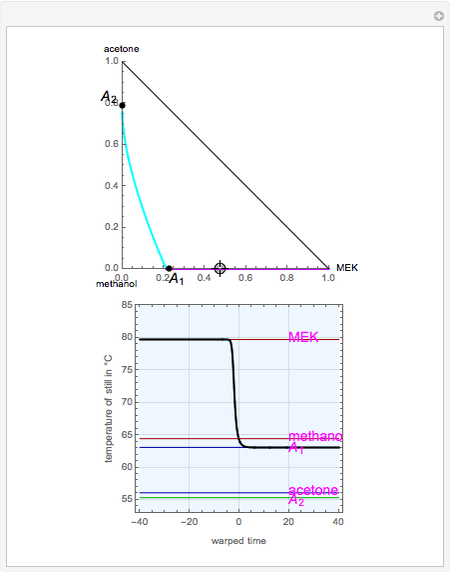 This Demonstration shows that MEK (boiling point ) cannot be used as an entrainer to break this azeotrope at 1 atm. 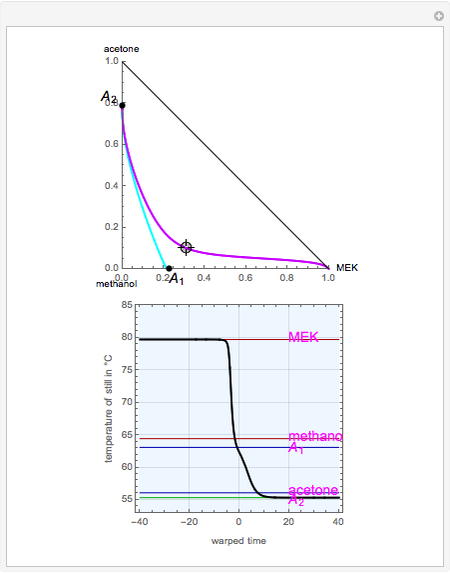 Indeed, MEK forms with methanol a minimum boiling azeotrope ( mole % MEK at ), and a distillation boundary (shown in cyan) divides the composition space into two distillation regions. Methanol and acetone are separated by this boundary. 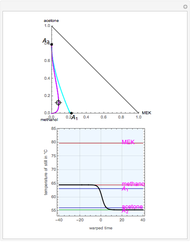 The temperature versus warped time clearly shows the nature of the pure components and azeotropes. 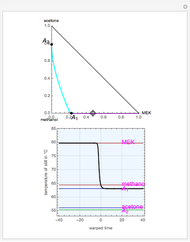 , indicated by a green line, is an unstable node. Acetone and , indicated by a blue line, are saddle points. 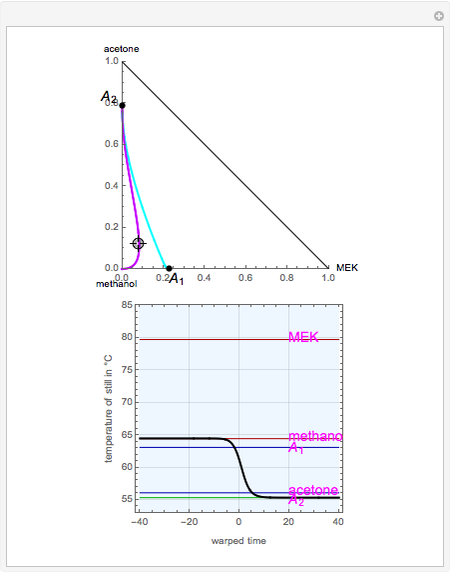 MEK and methanol, indicated by a red line, are stable points. 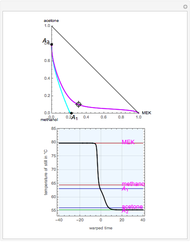 Two snapshots show what happens if you choose a simple binary mixture. Of course, for a ternary mixture, you have to select a locator position inside the triangular diagram. V. Julka, M. Chiplunkar, and L. O'Young, "Selecting Entrainers for Azeotropic Distillation," Chemical Engineering Progress, 105(3), 2009 pp. 47–53. Housam Binous "Breaking the Azeotrope between Methanol and Acetone with an Entrainer"